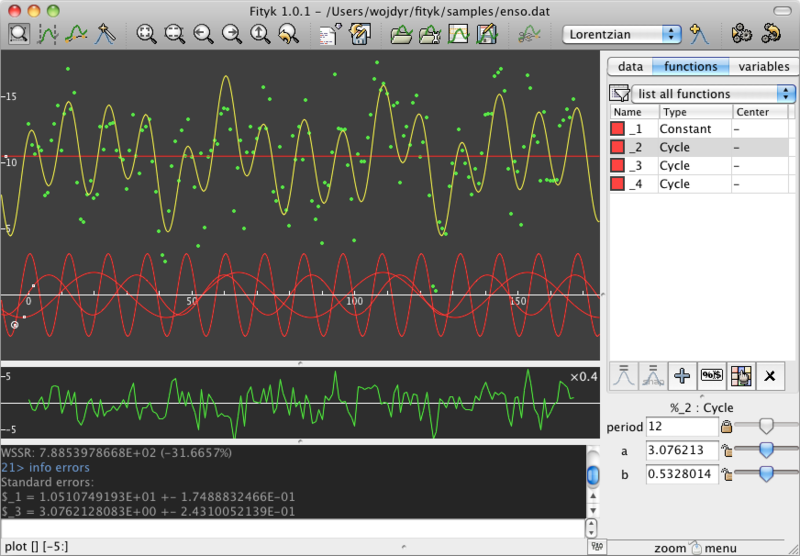 but it is suitable for fitting any curve to 2D (x,y) data. Linux: binary RPM and deb packages (files) for about 10 distros (incl. Ubuntu, Fedora, Suse), 32- and 64-bit. Installers for ver. 1.0+ used to be available to paid subscribers only. This made version 0.9.8 more popular than more recent releases. To change this situation the latest binaries are no longer paywalled. The author is grateful to all people who supported Fityk with subscriptions. Version 1.3.1 was released on 2016-12-19 (changelog). New version notifications are delivered via email and feeds. Manual (chapters Introduction, Getting Started, Data, Models, Curve Fitting, Scripts, All the Rest). PDF, ePUB and older versions of the manual can be downloaded from Read the Docs. Fityk Wiki (you are welcome to contribute). Feel free to send questions, comments, requests, bug reports, and success stories. Asking for a new feature usually results in adding the request to the TODO list or, if it already is in the list, in assigning higher priority to it.